What is bunny chow? 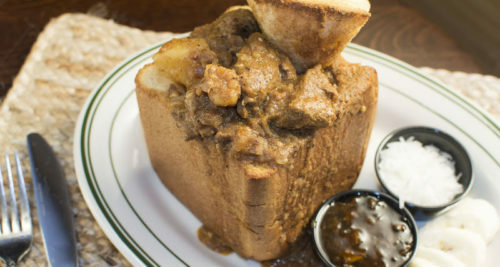 Bunny chow (a.k.a. 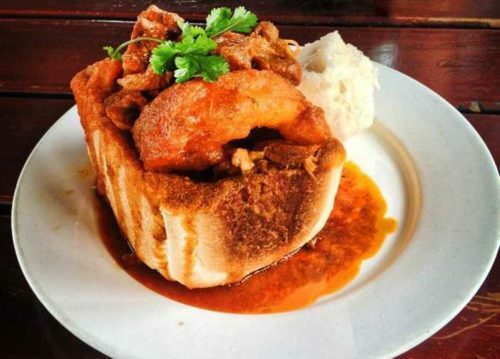 Durban bunny chow, bunny, or kota—short for quarter loaf) is a South African fast food dish that originated in Durban, a city in South Africa predominantly comprised of people with Indian heritage. 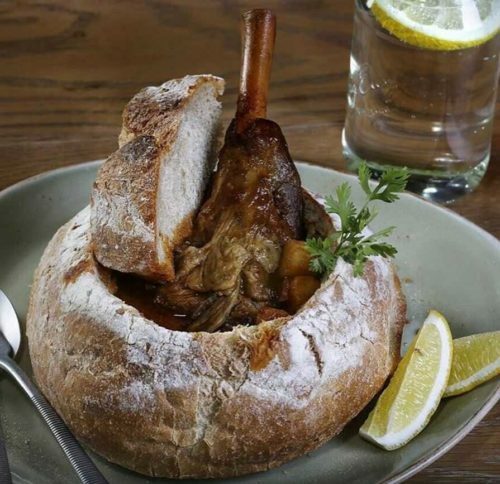 It is made of a hollowed loaf of bread filled to the brim with curried lamb, chicken or vegetables (not bunnies). The part of bread extracted from the loaf is called the “virgin” and is eaten by dipping it into the curry-filled bread bowl. It’s a bit reminiscent of clam chowder bread bowls, or chili bowls. 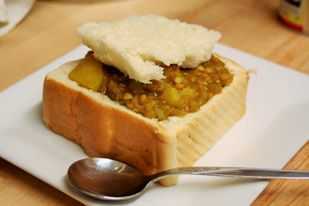 Like most fast food, bunny chow is traditionally eaten with bare hands. The history of bunny chow is questionable, but popular belief dictates that it was first made sometime in the mid 20th century by Indian merchants (known as “banias”) for Indian migrant workers so they could carry their food to the labor fields. Banias were mispronounced as “bunnies” and chow was a common term for food, so the term “bunny chow” was born. Where can I get it? 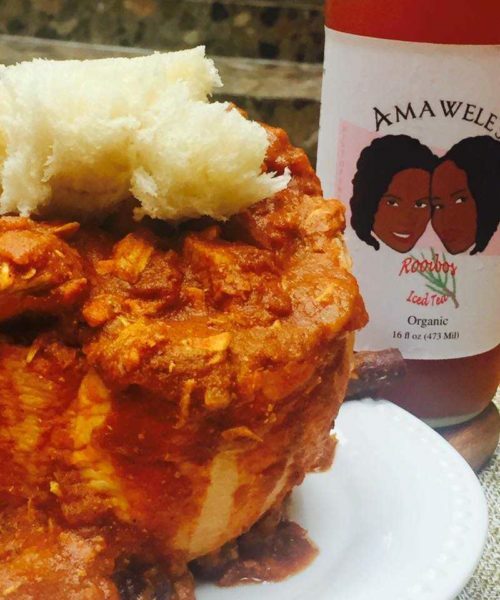 You can get bunny chow at some African, but primarily South African restaurants. 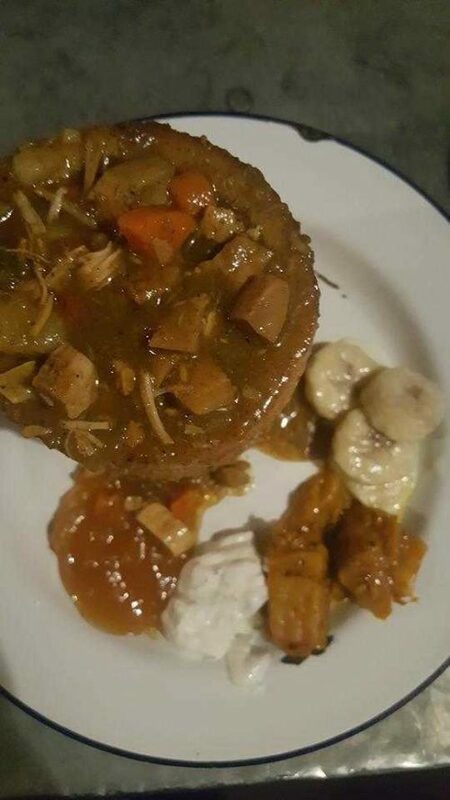 Here are several restaurants that are known for this dish unique to South African cuisine. Looking for more places that serve bunny chow? You can find them on Glutto right here. How can I make it? Bunny chow is really quick and easy to make, unless you want to do it from scratch. Rather than running around to get all the right ingredients, the best and most painless way is to pick up some good bread and good curry. 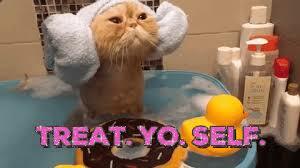 Follow this recipe, which you can save on Glutto here. Use a knife to cut out the middle of the bread and tear it from the loaf (leave bottom intact). Heat the curry in a pot (if necessary). Fill the loaf with curry and place the virgin (the middle of the bread) on the side.